Maria BRUTTI, The Development of the High Priesthood during the Pre-Hasmonean Period. History, Ideology, Theology, Brill, Leiden/Boston, Leiden, coll. « SJSJ 108 », 2006. 24,5 cm. 342 p. ISBN 978-90-04-14910-6. € 119/$US 177. Michaela BAUKS et Christophe NIHAN, éd., Manuel d’exégèse de l’Ancien Testament, Genève, Labor et Fides, coll. 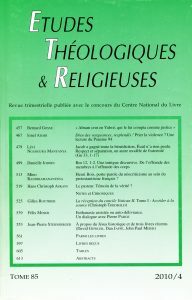 « Le monde de la Bible 61 », 2008. 22,5 cm. 236 p. ISBN 978-2-8309-1274-6. CHF 39/€ 27. Thomas HIEKE, Die Genealogien der Genesis, Fribourg, Herder, coll. « Herders Biblische Studien 39 », 2003. 23,5 cm. xii-420 p. + tableaux. ISBN 978-3-451-2806-5. € 60/CHF 102. Francesca STAVRAKOPOULOU, King Manasseh and Child Sacrifice. Biblical Distortions of Historical Realities, Berlin/New York, Walter de Gruyter, coll. « BZAW 338 », 2004. 23,5 cm. xvi-405 p. ISBN 978-3-11-017994-1. € 118. Jack R. LUNDBOM, Jeremiah 21-36. A New Translation with Introduction and Commentary, New York, Doubleday, coll. « The Anchor Bible 21B », 2004. 24 cm. xiv-649 p. ISBN 978-0-385-41113-4. $US 45. Jeremiah 37-52. A New Translation with Introduction and Commentary, New York, Doubleday, coll. « The Anchor Bible 21C », 2004. 24 cm. xiv-624 p. ISBN 978-0-385-51160-4. $US 45. Mayer I. GRUBER, éd., Rashi’s Commentary on Psalms, Leiden/Boston, Brill, coll. « The Brill Reference Library of Judaism 18 », 2004. 25 cm. xvi-914 p. 1 carte. ISBN 978-90-04-13251-1. € 192/US$ 274. Joseph MÉLÈZE MODRZEJEWSKI, La Bible d’Alexandrie. Troisième livre des Maccabées, Paris, Cerf, coll. « La Bible d’Alexandrie 15.3 », 2008. 20 cm. 190 p. ISBN 978-2-204-08690-5. € 35.